Grassroots Fabric Pots offers Classic Pots and Shorty Soil Savers. Shorty Soil Savers are designed to be wider and shallower allowing for more horizontal freedom in root structures. This sort of pot requires less soil for more surface area. It has its own benefits to the plant and soil. Classic Pots, on the other hand, are sized a bit more traditionally. The taller sides allow for deeper soil biology and more vertical freedom for roots. The diameter is tighter, which conserves grow space. Having a fabric pot that meets your needs as a grower is important. Will I be using clones? Clones are trimmings from a mother plant that have been re-planted to grow on their own, independent from the mother plant. Roots that start from a trimming form an adventitious root system stemming from the bottom of the clone. These roots typically only penetrate the soil to depths of around 12-18 inches. Clone roots prefer plenty of width to work with instead of depth. Because of this, Shorty pots are better suited for growing with clones. Will I be growing from seed? Most plants, when grown from seed, shoot down a strong taproot. This taproot penetrates deep into the soil so that smaller roots can shoot off and reach further depths than a clone’s roots. When growing from seed, a deeper pot would better suit your growing needs. A seed’s growth can be stunted by a shallow taproot. The plant you put in the pot isn’t the only thing you need to consider when choosing your pot. What about your soil? Will I be growing with Fertigation? Fertigation, one of the most common growing methods, is simply growing with fertilizers and water-soluble nutrients with some form of irrigation. The goal is to feed the plant directly, so it receives all the nutrients and minerals it needs to grow. The soil acts as a medium to hold nutrients for the plant to grab through its roots. A Shorty Soil Saver is ideal because it allows for faster feeding cycles. The soil in a shorter, wider pot is shallower. It will drain faster and allow for faster flushing of nutrients. Will I be growing with NoTill? The notill growing method heavily contrasts fertigation. When growing in a notill system, feeding the plant isn’t the goal. Instead, through organic methods and microbiology, the goal is to set up a soil food web. This living soil allows the plant to decide when it needs nutrients and minerals. Instead of you feeding the plant, the soil feeds the plant. The minimum recommended size for a living soil ecosystem is 30 gallons, and deeper pots yield better microbiology. Pick a Classic Pot and invest in your soil if this is the route you choose to go. Pots aren’t the only way to go. 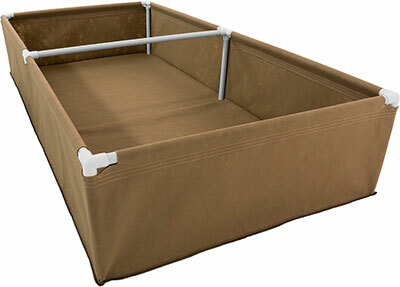 Fabric raised beds provide a different type of container with new benefits! Check out this article comparing fabric pots vs raised beds. Make sure you’re buying the container that best suits your needs as a grower. It seems like the answer to so many of life’s questions is: “It depends.” Unfortunately, the quandary of raised beds vs. pots is no different. There are so many different methods of growing plants, and it really depends on your space and your growing method. We’ve gathered the points we think are most compelling in favor of each choice. Hopefully this will help you make your decision on what’s best for your grow. Get more plants per square footage with raised beds. This is the most popular reason people have switched to raised beds for their greenhouses and indoor grows. Many methods of growing, including “living soil” or “no-till” growing methods, are based on having increased organic soil microbiology. Raised beds provide an optimum scenario for this because your soil takes longer to dry out. Supporting a thriving microbiology is very hard in small pots – anything less than 45 gallons of soil will dry out rapidly. If your root zone completely dries out, you have potentially killed some valuable microbes, taking a step backwards. The bigger your soil mass, the longer the moisture retention. You will have to water smaller pots more often than you would a raised bed. In a raised bed, there is more room for the roots to expand! Each plant’s root system can interweave with the others for overall larger root growth. And bigger roots mean bigger plants. Smaller pots can require transplanting, which takes time and more pots. Also, each individual root system in a fabric pot might require its own unique care and maintenance. The plants in a raised bed share a root system and soil mass and can help take care of themselves like a community. It is possible for your plants to communicate when they share a soil system through something called the mycelium network. This may help your plants fight disease together as a unified force. A big downside to raised beds is how much soil you have to buy to fill them. Keep your soil costs down by using fabric pots. If you’re growing in fabric pots, and (God forbid) one of your plants becomes diseased, you can remove it easily and your other plants are not threatened. Fertigation and other methods of feeding require you to dump your soil at the end of the cycle and start fresh. Fabric pots can be dumped easily and washed in the washing machine. If you’re not dead set on the layout you’d like for your grow, or you think there might be a possible move or lease change in your future, pots are a much safer way to go. You can work 360° around each of your plants if they are in pots. In a raised bed, you often only have access to two sides of each plant. If you are going to try something new, try it in a couple fabric pots to make sure it works out. Prolific plants might be better grown in fabric pots – especially if your intention is to grow several types of plants together in one raised bed. If you’d like to talk about any of this more, feel free to contact us! We have a couple people on the team that nerd out on this stuff and would love to talk with you. What’s the difference between black and tan pots? Glad you asked! The essentials are the same between the two colors. They have the same amount of breathability for your root systems and will both help you grow happy plants, no matter what you are growing. Also, both our black and tan fabrics are made from the same USA manufacturer, so there are no differences in texture, thickness, or quality between the two colors. When taking a closer look, there are a couple factors that might help you decide between the two. Most growers who have used fabric pots before will tell you that there is a slight temperature difference between black and tan pots when the plants are placed in direct sunlight or greenhouse environments. If you are in a warm climate and growing outdoors, for instance, you might choose tan pots to shave off a few degrees of heat from your root system. Cooler climates may choose black pots to keep their plants slightly warmer. 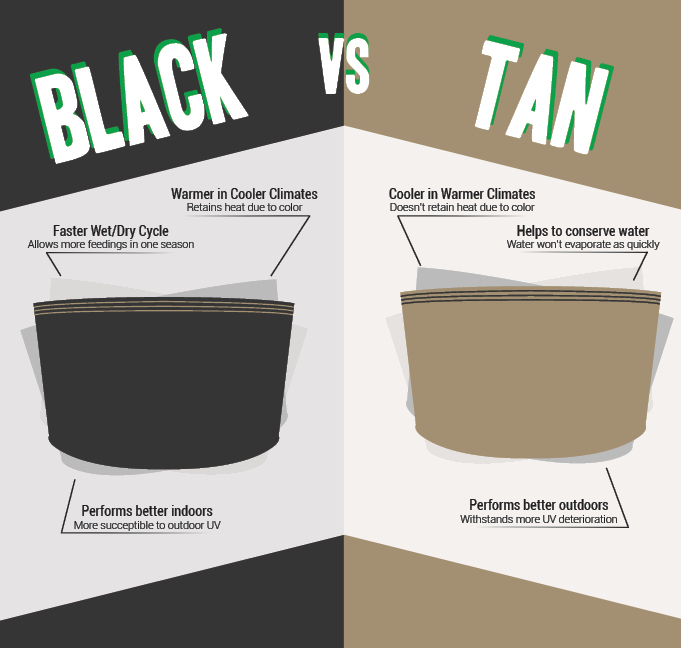 Because black pots can be slightly warmer, they will actually drain and evaporate water faster than tan pots. This will be most noticeable in outdoor growing, when the plants are exposed to direct sunlight. Some of our growers have noticed, when growing in black and tan side by side, that they have to water the plants in black pots more frequently than the tan. So if you want to conserve water, consider tan pots. If you are happy with a faster wet/dry cycle for plant feedings, consider black. The fabric used for fabric planters is a nonwoven polypropylene, and most (including ours) have been treated to withstand UV rays. However, over time, the fabric will break down, especially in direct sunlight. Just because of the color, our growers report that the tan fabric lasts a little bit longer than the black. We expect our pots to last at least 4-5 seasons, but black pots in direct sunlight are probably more likely to last 3-4 seasons. Why would I reuse my pots? Get efficient and keep your cost per crop down! Buying new grow pots every time can be expensive. 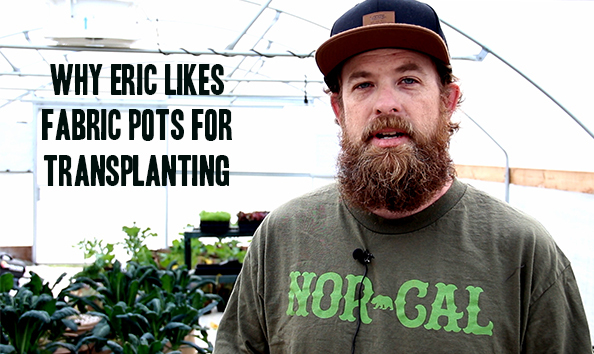 You could save 20-30% off your crop cost by reusing pots. Grassroots Fabric Pots are made with the “good stuff”: strong USA-made fabric and thread. We have made them to last through multiple harvests. Why should I wash my pots? Depending on your growing methods, you’ll want to remove residual chemicals that came from your nutrients and growing mediums before your next grow cycle. Give your new plants a fresh start. How do I wash fabric pots? Pre-wash pots with a hose. Try to get the larger pieces of soil and plant material out of your pots by hosing them down. Let them dry out for at least 24 hours, then shake or knock out more dried-out material. We recommend new washers to avoid contaminants that might have been used to wash clothes. It helps to have an industrial model to handle the sediments of the growing mediums. Fill the washer with fabric pots. Don’t overfill. In our video with the basic washer we bought, we fit 8 or 9 30gallon pots. Add baking soda and white vinegar. This is our suggested detergent. It’s natural and it has no chemicals that might bind to the fabric. We recommend using this or some kind of organic detergent to remove the calcium and other residual materials from your pots since water alone won’t quite cut it. Wash in the coldest water on the heaviest setting. It may require more than one cycle. Air dry 100% before putting away. If you put away your pots before they’re 100% dry, it could invite mildew or mold. Not sure if we really need to mention it, but don’t put your pots in a dryer as that would be no bueno. How do I store my pots? In a cool, dry place! Fold them, squish them, bundle them – store them however you’d like. If you’ve got any questions, we are happy to help. Shoot us an email at info@grassrootsfabricpots.com or give us a ring at (916) 822-2177. How Tough is a Grassroots Fabric Pot? There are a few design choices we’ve made that add extra strength to our fabric pots. We use UV-resistant, chemically stable (BPA Free) fabric. We sew our bottom seams on the outside instead of the inside to prevent rotting and we use a dual needle, 5-thread safety stitch with an extra seam for even greater toughness! Our pots 30 gallon and larger all have a triple seam hem to make the pot easier to grip. Add these all together, and you get a high quality fabric pot! Why use fabric pots for transplanting? We were very happy to make a visit to Grass Valley, CA this month to talk with Eric Brandstad at Forever Flowering Greenhouses. We got a tour of his amazing facilities and chatted it up about light deprivation and fabric pot benefits. Luckily, he was willing to jump on camera for us to share some of his knowledge with you! If you’re interested, check out our fabric pots we’ve made especially for transplanting –> The Transplant-inator. A benefit I see of using Grassroots Fabric Pots, or textile pots in general, is that they’re better than plastic pots for transplanting. When you have a 5 gallon or a 3 gallon pot, or even a little Dixie cup for that matter, you want your starting material to be pristine and your best foot forward. So when you start to get root-bound plants in these small containers, especially plastic pots, it’s because typically roots source to the outside. Then when we water, the water drains right through the middle. We’re not actually getting hydration or saturation to the plant. When we don’t get these to the plant, it’s not growing to its fullest potential. What we want to do is help it grow to its fullest potential and grow more naturally, and that’s why I believe that fabric pots are better. Anytime that you pull a plant out of a plastic pot and you see the roots bound, or growing around the outside, you know that the plant has gone through some type of abolic stress. It’s not getting the hydration or saturation it needs, and that’s what develops into disease and mold and problems in the future. For that matter, I’m a big fan of the Grassroots Fabric Pots, or any of these pots that actually help you maintain better control. That’s another word that a lot of people look at the word “control”. It usually means temperature and humidity. A lot of times for me it means: Are the roots growing more naturally? Are we able to sustain better hydration and saturation for the plant? Is all the water absorbed into the center of the medium? A lot of times we see the center of the soil dried out and the outside is more saturated, and that saturation is what the roots want to follow. So if we keep the roots in the center growing more naturally, especially the people that are using smaller ones in the flood and drain tables, we might be able to cut out one of the floods in between. That would mean more nutrient savings, more water savings, and we still have plants that grow to their fullest potential. Aloe vera is awesome! Besides being a succulent, it contains a nearly magical goo full of helpful enzymes that helps plants grow faster and stronger. The gel found inside the aloe vera plant can be used as an organic and all natural cloning gel. Just rip off a piece of the aloe vera and use that goo! These enzymes also work great for seed germination! Plant some goo with your seeds and watch them grow faster and stronger. You can always mix some aloe vera goo into your water for awesome results on your root systems! If you plan on growing aloe vera, be careful not to over water. It’s easy to drown a succulent! 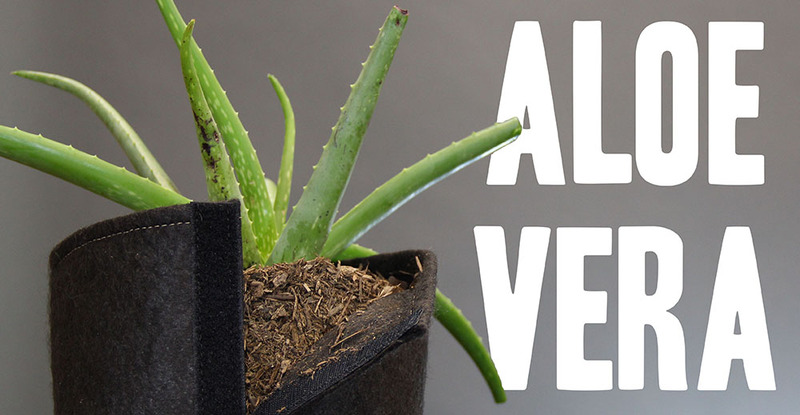 This is why growing in a fabric pot helps make growing aloe vera easy. Fabric pots drain quickly and lower your risk of over-watering! This is the most common question we get from new growers. Soil is a popular growing medium for container gardening and is often the hardest part to get right. Consumers are bombarded with a wide range of soil options ranging from simple “potting soil” to specifically formulated mixtures that are designed for certain types of plants. Narrowing down your options and selecting the proper soil can often feel daunting. Soil isn’t just a bag of dirt, it is a blend of ingredients that together make up what we refer to as “soil”. The type of ingredients that you want in soil depends on what you’re growing and what characteristics you need from the soil. Adding and removing certain ingredients can affect the soil’s ability to hold water, provide ventilation to the roots, and deliver nutrients, so getting the right soil composition for your plants is really important. How Do I Know Good Soil When I See It? Regardless of what you are growing there are some general traits that are desirable when seeking a quality soil blend. As a rule of thumb, you always want a soil blend that is easy to handle, lightweight, and has a good texture. Ideally soil should be fluffy, which will make the soil easier to work with and will encourage maximum growth. A soil that is too dry will result in low water retention and a soil that is too dense and clumpy won’t be able to drain properly. An ideal soil mixture will also be free of pathogens. Some examples of soil pathogens are harmful soil bacteria or weed seeds that might interfere with your plant’s growth. Learn how to detect signs of bad soil to avoid jeopardizing your grow. If you’re not sure about the exact requirements of your plants or if you’re growing several different types of plants at once, then an easy option is to buy a commercial grade potting soil such and some mulch from a local nursery to supplement your potting soil. We checked with our local nurseries and a couple of popular brand suggestions we got are E.B. Stone and Fox Farm. Potting soil is usually premixed and contains a good combination of essential ingredients such as: compost, sand, sphagnum peat moss, and fertilizers that deliver nutrients into your plant’s roots. Although each brand of soil will differ in composition and consistency there are some general traits that are desirable when seeking a good soil blend. For example whenever picking a soil you want to look for a mixture that has low water retention and a fluffy consistency. With soil selection, you typically get what you pay for, so cheaper options aren’t necessarily the best route for your plants. If you find that a generic commercial soil doesn’t meet your growing needs, we suggest purchasing a local and organic soil from a local soil company. Like food, soil is best when it is locally sourced and organic. You want to aim to decrease the number of middlemen between you and your soil producer to ensure the highest quality and consistency. Typically, locally mixed soils produce the best results because they are free from debris, pathogens, and contaminants that can negatively affect your plant’s growth. Certain plants are meant to thrive in specific soil and environmental conditions. For example, succulents are a type of desert plant that requires a soil with good water drainage. If your plant is high maintenance and has special needs in order to thrive, then using the right soil is crucial. There is a wealth of information on YouTube and other sources that can help provide specific information about your plant’s needs. After deciding on what soil works best for your needs, it’s important to take notes and evaluate the performance. Document which brands and formulas work best for your plants. When you notice that a soil mix performs well, then stick with it. If the soil you are using isn’t producing your desired results then don’t be afraid to switch or try a combination of two or more soils. Feel free to contact us with any questions, our soil specialists will get right back to you.